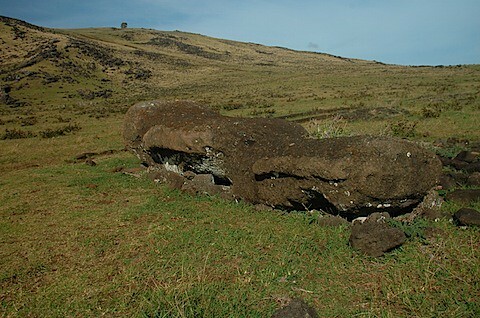 Part of our analyses here on Rapa Nui consist of observing moai in their various forms -- at the quarry, in the roads, on the ahus. There are a number of attributes related to the technology of carving, transporting and displaying the statues that can be discerned - a fact I puzzle over given the lack of previous acknowledgement and abundant crazy speculation. To paraphrase: "What were they thinking when they described the moai?" Anyways to help document some of these things, I created a photosynth of one of the "fallen" moai that failed during transport (or at least that is my current hypothesis). This synth worked out fairly well and has a lot of good detail about moai morphology (click the ctrl key to see the point cloud).